I would wait until you are finished with your current series. What a great testimonial! Sing it, sister! So nice to see you getting what you want! Keep working it now...put that man in a honey jar and sweeten him up to you something fierce! Make sure you keep us informed! Good luck to you... Good men are Good Men! I just received my Cut and Clear bath crystals, and I might bite right through the damn package before I ever get to the tub! The scent is DELICIOUS. Just don't drink all the bath water! Hi! When taking a cut and clear bath, do you toss your bathwater towards the rising sun? Or to the west towards the setting to get rid of the things you want to cut and clear? Thanks! 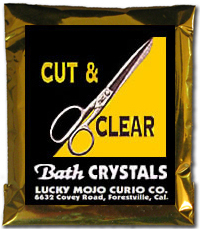 Re: Cut and Clear Bath Crystals for Depression? I was curious to know if anyone has ever prescribed Cut and Clear as part of a remedy for depression? Thanks! I hadn't thought of Cast Off Evil. Do you think they could be used together depending on the source of depression/sadness that Cut and Clear be done first then Cast Off Evil? I just ask because I remembering hearing Cut and Clear as a suggestion years ago and wondered if this was used for that purpose or not. In my practice, I use Cut/Clear for love removal only. I suggest before doing the Cast Off Evil to cleanse yourself with a bath of Road Opening. This allows the roads to open for the Cast Off Evil. You are so welcome for the help, good luck! I am currently working on a gentleman. He is vey damaged in love and I was advised by an AIRR rootworkers to do a cleansing and uncrossing. And then some love work. I want him to release the pain of the old loves, and the damage they caused him. But I don't want to release him from me and I do happen to be an old love. What would be the best course of action to take here to clean up that residual negative debris without undoing anything I've done or him forgetting me? We are currently together. But I will be doing this on a dolly. Please feel free to link me to lucky mojo supplies as well!! That would be healing spells! Your petition would be to heal him from past hurts and emotional pain inflicted by others. Ok soo i dont have a tub but i just got my cut and clear bath and need to take how can a espiritual bath be accomplished if you lack a tub also how many baths should i take?? Use a large basin to stand on in the shower, a large pot to prepare the bath on your stove. Once you are in the shower get the prepared bath Tea of cut and clear an pray while you slowly pour it over your head. Collect the water in the large basin and dispose of the water per instructions on the spell. Just did this spell the second time myself. Wish you all the best. You can usually get two or three baths out of a packet of bath crystals, if you haven't used them all already. Hi, i was wondering is it normal do have a lot of fond thoughts of your ex after the cut and clear spell>? This is my second time doing the spell after a year, i dont recall these same feelings the first time. I did it this time to just clear and cut away all past relationship issues with my ex and a guy i dated for 5 months. However i keep thinking about my ex ( the one i really loved, and also the same one that hurt me the most) I keep having flashbacks of why i loved him and what he had, that the guy i dated didn;t and why my love for him was so intense, is this normal? I know for a fact i dont want to me with him , but i keep seeing his name and signs everywhere but i dont even want him back, i know he wants me, but i dont want to ever go back to that relationship .I just want to cut away all past hurt, comparisons, and memories of them so i can move forward without carrying any of the old baggage... I do have a reaching scheduled with Miss. Cat in 3 weeks., but it will be so helpful to get some insight so i dont feel so confused and lost. I wouldn't stress about this, I think it's just the brain's normal reaction of purging all the old memories and feelings. Just make sure to back up your Cut & Clear work by actions such as wearing Cut & Clear oil and washing your bedding with Cut & Clear bath crystals. I'm glad you have a reading with Miss Cat, that will help! Thank you SIster Jean:) Ya i just did a another love uncrossing bath last night to help with the withdrawals and i have also been using Van Van oil on my feet and head. Cant wait till my reading! I bought Cast of Evil and Cut and Clear crystals not too long ago. So far I have done two baths and I am curious about something. Every time I do the bath (I mix cut and clear and cast off evil together) I immediately feel better. However, like an hour later I have a rush of intense intrusive and negative thoughts which is one of the issues I am working on. After, a few hours everything calms back down again mentally. It has happened every time I take the bath. Do you all have any advice on how to avoid this? Is there any other LM product that might work better for me? Perhaps adding in Clarity bath crystals would help you, to help you see things as they really are and not through a slanted negative lens of anxiety. Also, I hope you would consider seeing a doctor about this problem. You shouldn't be having to suffer with intrusive thoughts. I must have been on some wavelength or something because I bought the Clarity crystal before I ever read your post. . Thank you. My ex left me 10 years ago, he is still in my life because we have kids. I have no feelings for him only pity because he is married for 8 years now and not happy. I do think he has feelings for me and because of that he is very spiteful towards me and hates me. I also fed him menstrual blood right after we split up hoping he’ll get back to me (that was before I found Lucky Mojo). Will me taking Cut and Clear bath help me? Or should I get oil and lay tricks for him. I haven’t had a new love since him, I’ve been single for 10 years and I’d like to fall in love again but I need him to let me be. Cut and Clear is a product for you to use to cut the past people out and their hurts and clear them away, then open the path to bring new love into your life. After doing this spell I would then follow it with a love attraction spell to bring a new lover into your life. Cast off evil or protection oil are both to wear after the cut and clear to keep those feelings gone and support you as you move on. Thank you so much JayDee! If I do a cut and clear bath or spell or a 13 herb bath/ hypos bath will that undo my current spell work that I’ve done? I need to take a spiritual bath after a freezer spell I did last night but I don’t want to undo my current work. I also want to do a cut and clear for my feelings for my ex but if I do that can I do a pay me money honey jar after or reconciliation honey jar after? He owes me a lot of money but we aren’t speaking right now because he won’t talk to me because I told his friend he assaulted me and now he’s mad that people know. So I know the best way to get him to pay me is to sweeten him up to me but I just can’t deal with my feelings for him one second I love him and the next second I’m pissed with his treatment of me. A cut and clear takes away emotional ties you have to another person it does not have any effect on the spell work. A spiritual bath for negative work is traditionally hyssop. Why would you do a cut and clear then reconciliation jar on him at the same time, that is mixed signals. Pay me now product is used to make a person pay you. to distracting for me but I still want him to have feelings for me. I know that sounds selfish but I know this man and if he doesn’t have feelings for me he will not help me. And I’ve read on this form that if I do a cut and clear it takes his feelings away too. I would very much like to know where on this forum you read that "if I do a cut and clear it takes his feelings away too." Once I find that, I will gladly correct it. It is not true. Cut and clear is to cut YOUR ties. Period. I have been advised to do cut and clear baths, however I have been told that I am allergic to lemongrass and other grasses. I haven’t been able to find a listing of what is in cut and clear bath salts and am wondering if it contains any grasses. Ideally I’d like to be able to make my own salts so I can avoid any of my other environmental allergies as well. Hello, tyak, and welcome to the Lucky Mojo Forum. This is a community space for the customers of our shop, the Lucky Mojo Curio Co. We don't exchange recipes; we make products for sale, and this forum is where we provide customer service and spell-casting information to those who purchase Lucky Mojo goods. We do not list the ingredients of our spiritual supplies, they are not guaranteed to be hypoallergenic, and since you want to make your own products at home anyway, this is probably not the forum you are hoping for, and you would be better served by looking elsewhere.